The Allianz Arena was illuminated in the LGBT colors this weekend when many supporting festivals took place. Sadly, the comment section was infested with homophobic comments. I didn't expect this from Bayern supporters. P.S went on to read the very first of the comments. One said why does not football separates itself from such things? Wow, what a shock to hear this from you, ramsej. I suppose you were the kind of religious guy very grateful when Bayern donated money to Vatican instead. Separate itself? There are gay players, gay supporters, you'll just have to learn to educate yourself and live with it. Dalv wrote: Wow, what a shock to hear this from you, ramsej. I suppose you were the kind of religious guy very grateful when Bayern donated money to Vatican instead. I am Religious but that has nothing to do. Says who, a book with talking snakes? I can't take someone seriously who takes his morals from the church in the 21st century. Marriage is a symbol of love and attachment. It's not bombardment, they just show up as much as other stuff (actually I think there's less than 5% coverage in a newspaper about it). You feel it overwhelming just because you can't stand it. What you want is to be actually hidden/censored. Last edited by Dalv on Sun Jul 16, 2017 8:20 pm, edited 1 time in total. Guys, **** politics and forget what the rainbow flag stands for for a minute: that Allianz Arena looks amazingly beautiful! FCBayernMunchen wrote: Guys, **** politics and forget what the rainbow flag stands for for a minute: that Allianz Arena looks amazingly beautiful! Was just about to post this, took the words right out of my typing fingers. Dalv wrote: Says who, a book with talking snakes? I can't take someone seriously who takes his morals from the church in the 21st century. Marriage is a symbol of love and attachment. 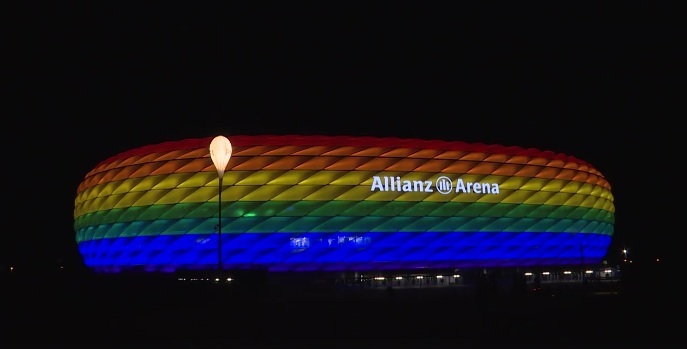 Let us light the allianz arena with the heterosexual colour...oh wait is there a colour to mark us? Why can't one live his private life as he / she pleases? Now they have all the rights they asked for. ramsej84 wrote: Let us light the allianz arena with the heterosexual colour...oh wait is there a colour to mark us? One thing that I find interesting is that both seem heavily derived from transgender symbols. The trans flag is the same but with both pink and blue on each side of the white row (so blue-pink-white-pink-blue) and the trans symbol is the same but instead of the two circles being linked (like a keychain) they are merged into one circle. Dalv wrote: I can't take someone seriously who takes his morals from the church in the 21st century. Well then, don't... it's your choice. But don't expect us to take you seriously in return. "If any household or town refuses to welcome you or listen to your message, shake its dust from your feet as you leave." Again ramsej, heterosexuals are not discriminated against - anywhere... Homosexuals still are, even you are doing it, so no wonder they "took over" "the media"
Cause we all know when you talk about feminist issues with Islam it is a WHOLE DIFFERENT ISSUE!